I don’t know why, but I had always assumed that seeking pleasure by travelling in outmoded forms of transport – antique steam trains on narrow gauge railways in particular – was a peculiarly Anglo-Saxon aberration. That was before I discovered the station at Tournon in the Rhône Valley. I realised then, that what I had assumed to be un vice Anglais, was in fact universal. I wasn’t even looking for any new and bizarre occupations, I was in that part of France to visit the growers and try the wines from the little, but world-renowned, town just across the bridge; Hermitage. The wines of Hermitage are big, flavoursome and immensely prized. They used to be the most sought after wines in France, and in the nineteenth century were sold to the Bordeaux wine growers who used them to bolster up what were perceived to be their own thinner – and as a result, rather out of fashion – offerings. Even Château Margaux was not above resorting to this practise which was so widespread that the Bordelais coined the term “hermitager“, meaning to add some voluptuous Rhône wine to the blend in order to correct the perceived inadequacies of the Médoc. However, and as the world knows, the use of cheaper and stronger wines to “assist the blend” is not, nor has it ever been, confined to nineteenth century Bordeaux. Let the train take the strain. Heading south of Lyons, the right bank of the river is the curtain raiser for a region containing some of the most attractive scenery in France, the Ardèche. It is an area to explore by car, by foot or, in this case, by train. I know that going on a steam train is viewed, at best, with suspicion in some circles. But give it a try as I did, and I can assure you there was not an anorak in sight. The trip on the “Mastrou” from Tournon, some 33 kilometres up into the hills to Lamastre, is worth ever minute. Apart from the sudden relief of realising you don’t have to be on your guard against a wild 2CV hurtling down the hill on the wrong side, the gentle pace of the “Mastrou” as it chuffs up la Vallée du Doux towards Lamastre makes the hassle of getting to this part of France recede into distant memory. The little town of Lamastre is well placed as a base to explore the whole of the Ardèche, and it is but a short trip from there to the Mont Gerbier de Jonc, and the source of the Loire, as it sets off north, then west, on its 630-mile trip to Nantes and the Atlantic.Back in the valley, the view across the river is filled with the great hill of Hermitage. These wines, and the even more spectacular terraced vineyards of the Côte-Rôtie further up stream at Ampuis, produce wines that are deep coloured, choc-full of pungent flavours, immensely long lasting and, all in all, the sort of red wine to eat with a knife and fork rather than sip demurely from a glass. Forget your modern conception that only the Australians produce big, meaty shiraz wines, for here in the Rhône valley, using the syrah grape (re-baptised shiraz in Australia) is where it all started. 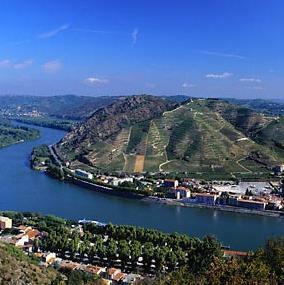 The Côte-Rôtie vineyards cling to the valley sides, where the bend of the river allows them to face directly south – hence the name, meaning “roasted slopes”. These are said to be the steepest vineyard slopes in France, and the two main sites are the Côte-Brune and the Côte-Blonde; local legend offers a variety of different explanations of who the Brune and the Blonde refered to, and why they had two of the most exciting slopes in France named after them. Indeed so big and powerful are the wines from here that growers use up to 20% of Viognier (more normally associated with white wines from the region) to produce a softer, more alluring drink. But it is not all wine in the upper Rhône valley. True, some of the town names as you drive south through the narrow gap between the mountains read like a page from one of the more un-regarded sections of a wine list – St-Joseph (another syrah-based red), or Condrieu and Château Grillet (viognier whites) – but this is not a wine region such as the Beaujolais or a river such as the Moselle, where vineyards stretch as far as the eye can see, it is a mixed agricultural economy. The really big Rhône wine area lies further south near Châteauneuf-du-Pape and Avignon. To get there, you have to pass a very strange test: can you drive round Montélimar without stopping, or will the chance of ruining your teeth prove irresistible? next day, cut into squares – and eat! That’s the basic stuff, but in Montélimar you will be told time and time again that the master nougatier will have his own secret additions and methods, that raise his product above the common herd. It’s a daunting prospect setting out to eat too much nougat, but it can be done if you persevere. The trick is not to drive whilst trying to get almond bits from between your teeth, nor whilst suffering from an excess of red wine at lunch. Let the train take the strain.